Whether you’re dreaming about attending I.C.E.or ready to up your Rapid Development game here in Madison in May, we’ve got you covered. @Andrea Meade is letting you in on her secrets to getting paid for your development. 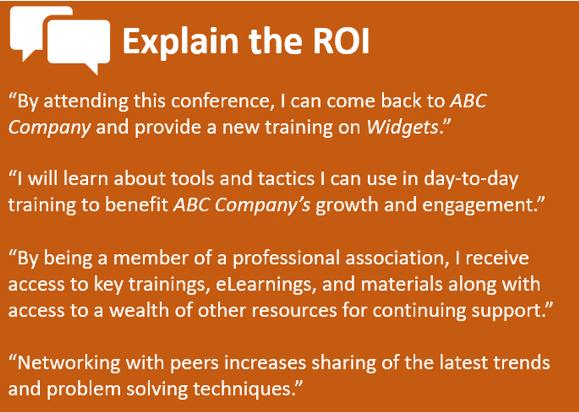 We’ve taken her advice, too, and provided you with the ROI for ATD-MACmembership based on Andrea’s strategy. I am often asked, “How did you convince your employer to help reimburse your expenses related to your professional certifications and development?” For instance, my CPLP was paid for in full by a previous employer. Conference attendance as well as professional memberships (including ATD) also have costs associated with them that my employers usually pay for. 1) Research your company’s policies regarding professional development and employee expense reimbursement. Many companies already have policies in place allowing for full reimbursement, while others will compensate a percentage of the cost, or may have policies contingent on performance or frequency of sessions. If you’re unsure what the policy is, reach out to your HR department or manager. 2) Once you have a clear understanding of the policies, research what it is you want to do and the costs associated for it. I recommend breaking it down into a spreadsheet to help outline your expenses and do the math for you. Use www.gsa.gov when calculating cost for meals, lodging and incidentals. There are perks to staying in hotels arranged by conferences, such as additional networking opportunities, free shuttles, and typically a negotiated rate that is better than the GSA per diem rate. Check plane fares often – the pricing does change periodically. Remember to include parking if you’re leaving your car at the airport or consider a ride sharing service. Don’t factor in just the cost of a class or certification. Remember to include things like learning materials, extra online classes, etc. 3) Now that you have your breakdown of the financial implications, you need to sell the opportunity and experience to your company or manager by conveying the benefits they will reap from your attendance. Depending on the subject of the training, you might find additional support on the website for the conference or the hosting organization. Make them understand the ROI for your entire team. What are the benefits of physically attending an event versus a virtual seminar? Why is this the best event/conference for you to attend compared to a similar event/conference? What will you bring back to your company as a benefit? Be ready with statements. 4) Document everything in writing. This is often times already a policy in place with your employer, but if not, it’s a great best practice. Specifically, written approvals should always be maintained should you need to submit expense reports, change managers, etc. 5) Once you receive approval, be sure to save the receipts if you pay for anything out of pocket.Remember to follow your company’s policies regarding expense reimbursement and record retention. If you have to use a company credit card. Be sure to also save those receipts. It’s important to remember, you can’t complain about not going to an event, or not having a membership if you never ask for the opportunity. Also hearing a, “No,” to one thing doesn’t mean it will always be a, “No,” to everything. Keep trying and show your value and what you need to continue to bring additional value to your workplace. Don’t be surprised to have a bit of back and forth when trying to obtain approval for higher cost items. The company and your manager want to ensure that money from their budget is going to something that benefits the whole and provides rewards everyone can use. Expect some resistance, but know that with persistence and the right justification, you may find yourself going to a conference, having your membership dues paid, or having more resources at your disposal! Andrea has been working in the talent development field for over 10 years and obtained her Certified Professional in Learning and Performance from ATD in 2014. She started training because she simply had a knack for it. Since then, she has continued to grow as a trainer and develop her skills and experience in facilitation, instructional design and coaching. A few years back I left my position as one of many trainers at my company, to become the sole trainer with a new organization. They wanted me to develop a training program for a computer application, implement it, and show success with it as soon possible – as in within a few weeks. It was intimidating. Sure, I was a trainer, but I didn’t have enough confidence in what I was doing to imagine doing it on my own. My new company had put their trust in me, and believed in me enough to follow a training plan I would generate. If they believed in me enough to get the job done, I needed to believe in myself too. Of course, that is easier said than done. I was lucky that this organization also supported career development. They helped cover the cost of my ATD memberships and paid for classes to help me learn the skills that would build that confidence I needed. Through this process, I learned about the Certified Professional in Learning and Performance (CPLP). The more I researched the CPLP, the more I realized this was a perfect fit and was clearly made for learning professionals of all walks of life. Though there are certainly a lot of positive aspects to getting your CPLP certification, but I wanted to share even more benefits based on my experience and also some concerns that are worth considering. If you think it’s something you would like to consider – go for it! And feel free to connect with me if you have any questions or need a study buddy! 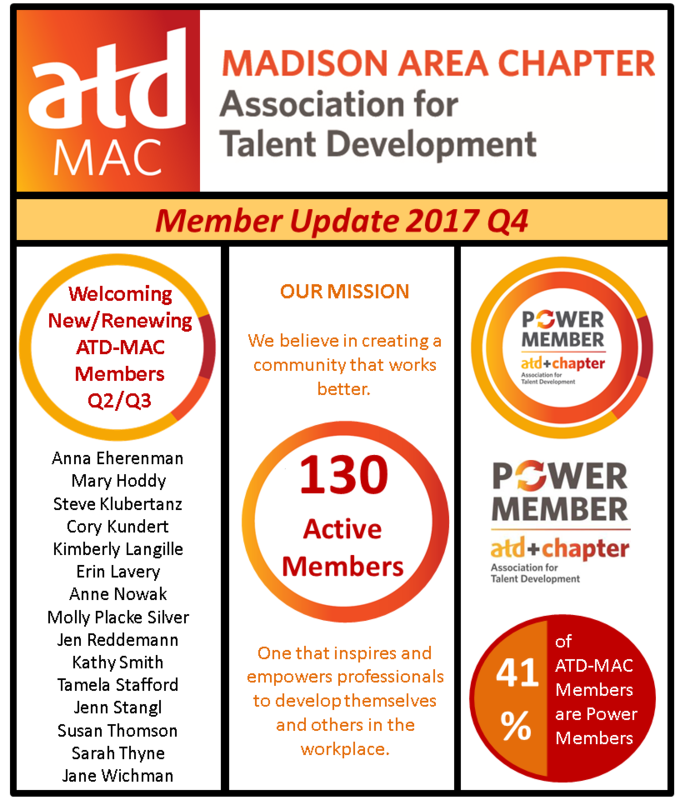 As I prepare to move off the ATD Madison Area Chapter Board for good, I cannot help but reflect on my experience in my nearly four years as an ATD Board member. Originally, I took a Board position to network and boy, has it paid off in that respect! I’ve had the privilege of working with amazing people, dedicated fully to the Madison chapter. Each year, the Board asks the essential questions, “What’s Important Now?”, “What Do Our Members Want?” “What Can We Do Better?” This honest analysis and focus on Chapter members is what has made my experience unforgettable. On top of that, I’ve been able to connect month after month with the best and brightest our community has to offer. Madison is a smart town, and each month is like having a short course for FREE. I’ll confess that attending events for free was another initial draw, and that too has paid off in dividends. Lastly, serving on the Board has given me renewed perspective on what it means to serve. Being a board member is not a particularly taxing time commitment. Yet, it does require showing up and being present, even when there are demands back at work. It means influencing without power while at the same time being influenced and advocating for member ideas or concerns. And it means caring, and surrounding yourself with others who care. I can attest that whatever challenges faced us as a Board and Chapter – I never doubted that everyone in the room really, really cared. Spring is a time of change and this spring we will be filling open Board positions in the President – Elect role, VP of Programming, VP of Administration, & VP of Membership as my colleagues currently in these roles also complete their years of service. Additionally, we’ve had a fantastic response since our Kick Off meeting in January for volunteers. We’re always looking for someone to help out – even small things like helping set up at an event. I encourage anyone who has thought about getting involved to reach out to Marc DeCarli, President – Elect, and make your voice heard. It has been an honor and a privilege – thank you. Jacob Burris has been in the training space for over a decade, working with clients nationally and internationally, and facilitating to diverse business groups. He’s an expert in onboarding, customer service, sales, leadership, virtual training and e-Learning design. He also is a firm believer that when we’re through learning, we’re through. Real talk: I think I was first drawn to training because I liked being the person who delivered “ah-ha” moments to people and because I loved being the center of the classroom’s attention. It’s a gross thing to admit, but it’s true. My approach to design reflected my desire to be the “sage on the stage.” Long, carefully scripted anecdotal monologues both let the learner learn and filled my lifelong dream of writing and starring in a one-woman Broadway show. My first training job was a department-level trainer onboarding new hires. So, I guess this approach to design wasn’t a bad one for the situation. A bit of entertainment goes a long way in helping people remember policy compliance. However, my next career step was as an organization-level leadership trainer. My classes were filled by leaders with experiences to share and who also wanted results and not just entertainment. Based on the audience and its needs, it was no longer the right approach to be the center of the learning experience. I knew deep down that something needed to change, but I wasn’t sure what it was or how to train any differently. When I read the theories of Howard Gardner, it was like a light bulb went off. Well, that’s a nice way to say it. It actually felt more like a brick hit me in the face when I read “While experts need to have some of this inert knowledge, classroom teachers need to know how to coach and encourage their students, so that students can gain various literacies, come to love knowledge, know how to learn, and know how to assess their own growth”. It was at that moment I first started to dip my toe into the world of Facilitative Learning. 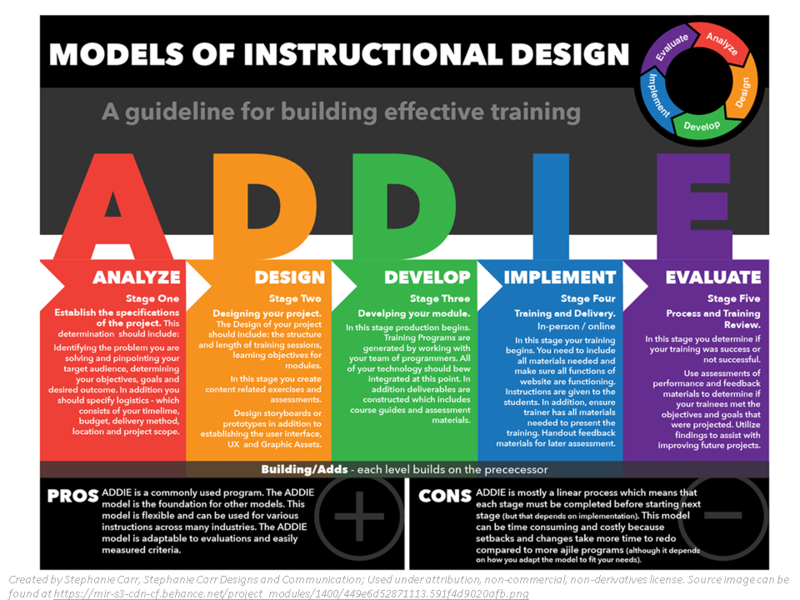 Facilitative Learning is an approach to adult learning design that believes learners learn best when they are deeply involved in their own learning through questioning, discovery, and real-world application. It can be risky as an approach, but it is also incredibly powerful. Making the design and facilitation transition to this new approach wasn’t easy for me. In fact, it was awkward and felt a bit like free falling at first. It took time and practice to get good at the approach. Facilitative Learning is not as simple as asking a discussion question here or there. There is real risk and it takes honed skill to successfully open up the flow of design and hand it over to the learner. What if they don’t talk? What if they don’t care? How do I direct the conversation toward the objectives? How do I redirect if they get way off topic? How do I balance scripted design and freedom? How do I ensure I have the appropriate level of challenge in application? That being said, it’s hard to describe the relief and freedom I felt when I let go of the need have “the answer” to any question. When I opened up my design to learner-centric exploration, I took the seat next to leaders as we struggled to find meaning together. Instead of trying to bring all the value, I was finding the ability to discover value together. The shift was incredible and the results were immediate. Classroom participation and engagement increased and the class was truly and fully transformatively learning together – myself included! I would challenge you to explore Facilitative Learning if you aren’t already. The rewards are well worth the effort. Coming up on March 15th, Jason Weber is sharing his success with Facilitative Learning in a session called “Creating Engaging Facilitative Learning”. I would highly encourage you to attend. Looking back, there were so many common pitfalls I could have avoided if I had been able to attend a session like Jason’s. I hope to see you there! I’d love to connect and chat about your design journey as well. Erin is a Quality Improvement Advisor focused on developing organization-wide training and improvement solutions for UW Health. 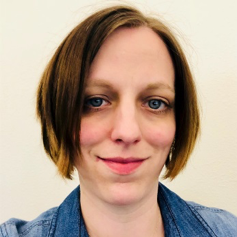 She holds a Master of Science in Adult and Continuing Education Leadership through the University of Wisconsin – Milwaukee as well as a Bachelor of Arts degree in German Literature and Pedagogy from Calvin College. In addition, Erin is a certified trainer for Development Dimensions International and Crucial Conversations as well as a certified Life Coach for students with disabilities. Erin currently serves as the VP of Marketing for the ATD-MAC. 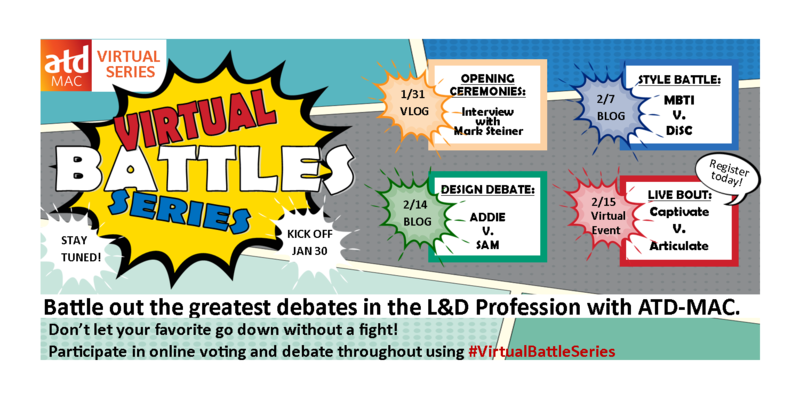 ATD-MAC’s #VirtualBattleSeries continues as we fight through the great debates in the Learning and Development profession. This week, it’s the Great Tech Battle in Articulate vs. Captivate. We’ve explored the pros/cons of each with Kevin’s VLOG earlier in the month. Now, it’s time for me to weigh in on how I see Articulate pulling ahead with Rise. Don’t forget to weigh in on LinkedIn, Twitter, or Facebook with #VirtualBattleSeries. I don’t know about you, but I’ve been pushed in the last five years or so to completely rethink how L&D “goes to market” with development solutions. I’m consistently being asked to move learning to a digital format to save costs. Create solutions in days rather than weeks. Cut one-day sessions in half, or better – less than two hours. Oh!, and learner’s need to be able to view courses on their phone or tablet. Sound familiar? So how do you achieve all this – digital, faster development, shorter learning and flexible delivery format? The answer lies with Articulate Rise and other rapid development software. It’s one of the reasons that Articulate pulls ahead in the Articulate v. Captivate battle. It’s obvious I’m a Rise fan, but don’t take my word for it. Rise just happens to be the tool my organization gave me. Do you own research and find a tool that works for you and fits your budget. I guarantee a rapid development software will help you overcome the organizational challenges mentioned above, not to mention it will make you look like an L&D all-star. Curt is the Lead Learning Programs Manager for QBE North America and has been with the organization since 2013. Prior to QBE, Curt spent 17 years with American Family Insurance mostly in the L&D space designing and delivering technical and leadership curricula. Creating a learning experience is not easy. There are can be many risks, complexities, and constraints. L&D professionals have several learning design methodologies to choose from: ADDIE, SAM, Learner First, Agile, and Design Thinking. Which is best is hotly debated, and two that are most contested are ADDIE and SAM. ADDIE stands for analysis, design, develop, implement, evaluate. It was originally designed for creating instructor-led training, and is considered to be a traditional waterfall method. In other words, ADDIE is a process designed to move things forward in a sequential order. It has been the go-to methodology for novices and experienced instructional designers and learning project managers for years. It is easy to follow, very detailed with many possible tasks, but it can be overwhelming as a result. Opponents of ADDIE also consider its design its biggest flaw; do all of the analysis, then design, develop, implement, and evaluate. 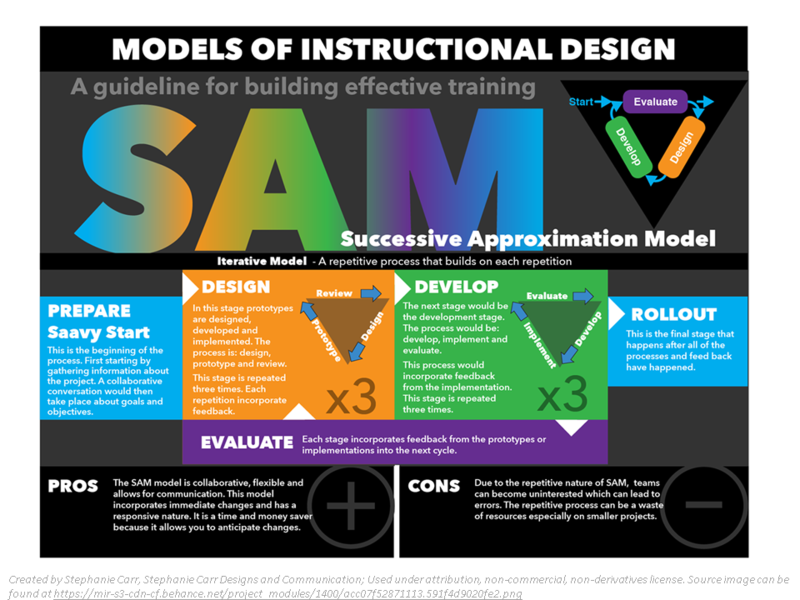 Successive Approximation Model (SAM) was created and is used primarily for e-learning development. Created by Michael Allen, CEO of Allen Interactions, SAM is an iterative and collaborative process that provides L&D professionals the greatest opportunity to create the most effective learning experience possible within its constraints. Allen’s goal was to create a methodology that is a more agile, effective, and flexible process that challenges learning designs early and throughout. In contrast with ADDIE, SAM is not a linear process. It arguably focuses more on learning experiences, learner engagement, and learner motivation than content organization, presentation of information, and summarize post-tests. While traditional approaches such as ADDIE seek to ensure accuracy and completeness of content, SAM works to uncover engaging and interactive learning events. In order for these learning experiences to be effective, they need to be meaningful, memorable, and motivational. Otherwise known as the three Ms. So, should ADDIE be thrown out with the bath water? Some L&D professionals say no, that right now ADDIE is still the easiest and most effective in certain circumstances. For instance, if you were asked to create a compliance training, a day-long instructor-led training or webinar, ADDIE can be very effective. On the other hand, SAM would be the more effective approach if you were asked to create an e-learning project (e.g., workshop for salespeople), with many stakeholders, is highly politicized, and everyone wants to be involved, where time is tight (i.e., six months) and cost is limited. While no process can address or overcome all the challenges that L&D professionals will face during an instructional design project, arguably, taking a more agile, interactive approach to design and focusing more on performance than on content can increase the chances of creating a brilliant learning experience. Both ADDIE and SAM have their pros and cons, as do other development methods. All of them provide a repeatable checklist that facilitates faster and quality development of learning events and experiences. But these methodologies can tempt you to follow them blindly. Learning development is a science and an art, and some tasks can be completed easily, while others require innovation and vision. Which ever approach you choose for your learning project, do not let it limit your flexibility. 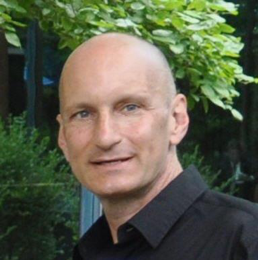 Marc DeCarli is an engaging talent development professional with wide-ranging experience in adult learning, facilitation, leadership, technology, and training development. He has 15+ years of experience developing and delivering training content to new and experienced employees, coaching, and leading teams in challenging and dynamic organizations. As part of ATD-MAC’s #VirtualBattleSeries, we’re fighting through the great debates in the Learning and Development profession. One of the battles I always hear is which personality indicator is better: DiSC or MBTI. Let’s explore the primary differences between them and see if we can settle this debate once and for all. 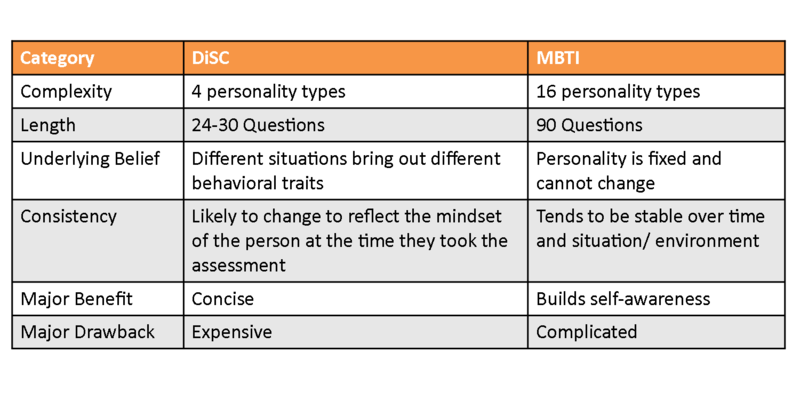 Both DISC and MBTI are assessment tools that provide insight into personality and behavior. Both are widely respected and used by individuals, organizations, institutions and corporations worldwide. Additionally, both are backed by decades of research and are their theories are scientifically sound. Like any personality profile, neither should be used as an aptitude assessment, a predictor of success in a particular job, a hiring tool, or a performance tool. So, what really is the difference between the two? Below is a basic overview of the differences. What is the objective/goal of the session? What’s most important for participants to come away with? Do participants want to understand how they think (MBTI) or how they act (DISC)? How much time does the team have to invest? DISC can be understood and applied more quickly – the model is simpler to interpret and for a quick-hit teambuilding session, can do the job well. Is this the first foray into self-awareness for this team or are they experienced with development tools? I have found MBTI is more useful for coaching, leadership development, and for addressing complex interpersonal issues. So, in the end, rather than declare a personal favorite, I’m going to say that the personality indicator should reflect the strategy and outcomes. Kimberly Bellefeuille has been involved in the Madison learning community for over 20 years. She is a certified administrator of Myers Briggs and a trained mediator. In addition to leading Professional Development at American Family, Kimberly designs and delivers a variety of training experiences related to unconscious bias, conflict resolution, team communication, change management, and strategic thinking. People describe her training sessions as high energy, relevant and engaging. We all have preferences in life. It’s no surprise that the Learning & Development field is full of preferences, too. In fact, Learning & Development professionals are famous for picking their camp and digging in. Captivate versus Articulate. MBTI Myers-Briggs versus DiSC Personality Types. ADDIE versus SAM. Build versus Buy. Vector Graphic versus Picture Image. Classroom versus Online. The list goes on and on. This month, ATD-MAC is sounding the battle cry. We’re duking out our favorite preferences and identifying clear winners in our Virtual Battle Series. It all starts with a VLOG with Kevin Smith and Mark Steiner. Mark is the leading guru on Captivate versus Articulate. They’ll be giving us the lowdown on the history of this notorious battle and what factors should influence a software debate. After this, we’ll have THREE BOUTS of competition. The Bout One will start on 2/7; it’s MBTI versus DiSC on the blog and we’ll be opening online debate using #VirtualBattleSeries. Throughout the week, join the debate and add your thoughts and preferences. We’ll put it all together and declare a clear winner before starting Bout Two. Bout Two will start on 2/14 with ADDIE versus SAM. Keep up your online chatter and defend your champion using #VirtualBattleSeries to share your experiences using either model. We’ll end with Bout Three in a Live Virtual Event showdown of Captivate versus Articulate with Mark Steiner – register today for the Live Virtual Event! We would like to welcome all of our new members and thank all of our returning members from Q4 of 2017 – see our Q4 Member Report below. We are excited to see you all at the ATD-MAC Annual Membership Meeting on January 25 from 2:00-4:00. Register today and hear all the things we’re planning for you in 2018. ATD-MAC is all about adding value to its members as we grow the profession together. Part of growing the profession together is having a chance to connect and brainstorm with professionals who are influencing the development field. Member Spotlight is one way that we introduce you to top influencers in the Madison learning community. In this quarter’s spotlight, we are honored to be able to feature Tamela (Tammy) Stafford. Tammy is a frequent participant in ATD-MAC’s monthly sessions and has shared her experience and expertise in leading the learning function forward. She is the Learning & Development Director for the Wisconsin Department of Employee Trust Funds. I am excited to be a new member of ATD since October 2017. My position at Employee Trust Funds as Learning & Development Director began in July 2017. My overall 25 years of experience as a Customer Service Representative, Employment Specialist and Quality Assurance Trainer Team Lead has provided an eclectic background. I returned to school after 14 years to receive my associates, bachelor’s and a Masters in Adult Education and Counseling. My education and experience has helped me to design and deliver a variety of training programs conflict resolution, team communication, job preparation and customer service. I also spend time teaching human services and sociology courses at Upper Iowa University. My family is my greatest joy and I am very fortunate to have two younger brothers and their families and my two sons, Jake and Josh. My sons were recently married to amazing women, so I now have some girls in my family! In the last five years at my previous position I developed an onboarding program for new case managers for the W-2 and FSET programs for Wisconsin. My new position as Learning & Development Director is exciting because I am developing a new learning & development process which will track our training projects and bridge resources our business areas will be able to share. One of my favorite projects is a new onboarding program for our employees, contractors and consultants. This program will help our new employees to learn more about our agency and start them out on the right foot at ETF. As a life-long learner I have enjoyed the presentations and networking opportunities ATD has provided and look forward more opportunities in 2018.